It’s funny what you find when cleaning out your computer files. In this case, it’s a tutorial that I created over two years ago after a rapid elearning workshop I had given. For some reason, I never ended up posting it. So here it is. The output of the workshop is an interactive tabbed notebook. 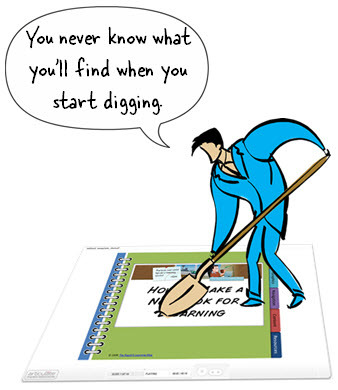 But the focus is really on learning some core rapid elearning tips when working with PowerPoint. Click here to view the rapid elearning workshop. If you’re just getting started with rapid elearning, this is a good basic workshop that takes you through some of the essential techniques. Plus, you end up a with a nice PowerPoint template. I built the workshop using the same notebook so you can see an example of the output as well. I also included the files for PowerPoint 2003 and 2007. All of the notebooks use the default color theme in PowerPoint 2007 so it’s easy to quickly apply a new theme with your own color scheme. I hope you enjoy the quick workshop and notebook templates. If you use them in a course, feel free to send me a link or screen grab. I’d love to see what you do. If you have any comments, please share them in the comments section. Stephanie did a nice screencast to show how to get more out of the free PowerPoint templates and make them look richer. Click here to play the tutorial. Great post as always Tom; I’ve become an avid reader of your blog and always look forward to seeing what new tips and tricks you have to offer. The notebook effect is very slick-looking and a wonderful example of what PowerPoint is capable of. One question: we use PowerPoint 2003 at work, and I’ve never really used the slide master before. Is it possible to change the layout of a slide to a master as easily as you showed in this demo? I’ve played around with it but couldn’t really get any results. Your tips are very useful as forever. I have been learning so much with this site. Fantastic powerpoint, will come in really handy! Thanks so much for a wonderful blog!! thank you so much! this was the first time I’ve created something like this in ppt, and it was so easy! I can’t wait to play around with it some more. You’re amazing!!! Thank you so much for sharing. I can see us using this template immediately. Keep up the great work, and as usual YOU ARE THE BEST! This is a wonderfully thought out presentation of a very useful template. I especially like the idea of using grouped elements saved as graphics. I can see where that will cut-down publishing considerably, not to mention save time during actual production. Well done! Great layout choice. Something I am likely to use. thanks!! @John: in PowerPoint 2003 it works a little different because the layouts are separate from the masters. However, you can create multiple masters. Wow, thanks Tom. This is sharp looking and has lots of good reasons to use it. I appreciate you and all you do for all of us! This was a great tutorial. I’m just beginning my work with Articulate and this gave me a great overview of how it works together with PowerPoint to create a course. Thanks! many thanks for your fanastic quick video tutorials. those would inspire to our initatives/creative minds…could i rent your brain…LoL. Only tiny downside on it..when if I have laptop(15.4″). I wish to click video tutorial screen to make maximise screen…..
e.g you use hyperlink to link page 1 to page 2 or put hyperlink on click for video tutorials. It should be fine for hearing people follow it with your verbal instructions by listening your mp3. I am profoundly deaf.i can hear your voice but could not understand it anyway. even i use my pc graphic tablet to zoom it…ah ha no luck yet? @Brendan: I use Screenr now for most of my screencasts because it’s easier to record at a higher resolution and let people full screen it. Unfortunately I did that screencast a while back with a different tool. You mentioned the difficulty of testing transparent hyperlinks. However, I noted in the tutorial that you set them to No Fill. I use 100% transparency instead. PowerPoint, 2003 anyway, treats those differently. To PPT 100% transparent fill is still there, like clear glass. No Fill is like a window frame w/o the glass: nothing to click on. Until I’ve adjusted everything, I set transparency to 75% or so. Awesome! Thanks for giving me a great for my next course. I am not able to download the templates… Can you kindly email me. @Ali: why aren’t you able to download the .zip file? Is the link not working? The hyperlinks at the end of the tutorial don’t seem to work; but the hyperlinks in the blog post above are working fine. @Michael: thanks for the heads up. I’ll see if there’s something wrong with the links. @Michael: I tested the links in four different browsers and they are working at this end. What browser are you using? In any case, the links are on the blog if others are having trouble getting the links to work via the browser. Tom, you and the other Articulate gurus have really helped me to evolve as a designer. I am relatively new to the eLearning arena having mainly designed classroom training in the past. I wasn’t wild about many of the online courses I had seen — they seemed to be not much more than a few screens followed by a (often silly) quiz/test, then a few more screens followed by another quiz/test, and so on —- pretty formulaic and REALLY boring! My assumption was that the designer was probably looking for some way to make the training interactive. I would never design a classroom training that way, so I struggled with understanding the value of online learning that was structured that way. You and the rest of the Articulate team have really helped to open my eyes to all of the exciting possibilites for designing informative, interactive training that grabs the learner in ways that are not formulaic and definitely NOT boring!!! A big thank you to all of you! Great presentation, however I had some trouble trying to follow your instructions as you spoke, since you were going so fast. Seems like it would be GREAT if you had a pause button to press durinig your presentation, so I could more easily follow your instructions. Love the template, but I don’t have articulate to publish, I’m having trouble publishing and getting the links between sections working. I’m sing Captivate 4. Any suggestions. @Heidi: I mostly use Screenr for screencasting. @Paul: you can pause on the bottom screen. In addition, you can always use the play bar to scrub back and forth. @Steve: your best bet is to purchase Articulate. 🙂 I’d jump into the Captivate forums and ask someone there who can give you specific Captivate help on adding the links. I don’t know if you already tried that. If you want the links over the tabs to work using Powerpoint presentation mode you may just fill them with white and set the Transparency parameter to 100%. It works ! By the way, thanks Tom for sharing your expertise. @Bertrand: good tip on the transparency. I usually don’t use that when converting to Flash because sometimes there can be some slight ghosting of the link. BUt for PowerPoint it works great because a transparent object isn’t easily clicked through. Setting the fill to 100% transparent fixes that. Thanks again Tom for sharing this! Very Nice and thank you for sharing. I was also curious what top 10 tools you have in your toolbox. Do you use anything like Camtasia? @all: FYI, I updated the post with a screencast Stephanie did to show how do even more customizations to the templates. @april: I’ve done some posts on some of the applications I use. For the most part, I use Screenr for my screencasts. I do most of my graphics in PowerPoint and then rotate between free applications to see how they work and if they’re practical to use. 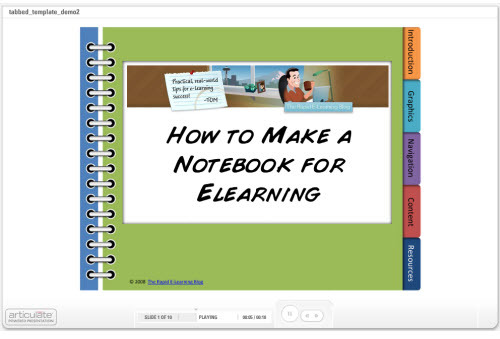 Of course, all of my elearning examples are produced with the Articulate tools. Thanks for the lovely post. Unfortunately I am unable download the .zip files. Could you check the links, I just hope this problem is not only from my end! This may just become one of my favorite “Tom templates” Your demo was detailed and provided all the instruction needed to replicate. Not many instructional videos are as simple and complete as yours! I plan to use this template to create an e-learning instructional user guide for our cyber school students and parents. “Notebook” layout is perfect for them. Will try to remember to send you a screen page when I am done sometime next Spring. You are the best! It worked like a charm,I guess there was an internet problem at that time which I didnot realize! I endorse all the above comments! I’m new to e-learning and am finding your site,tips, and your generous sharing of resources fantastic. I’m learning so much and get ideas. Thank you so much! This really opens up possibilities for my future e-books. I wanted them different, snazzy, and NOT in pdf format, for a change. Watching your ace video has just made this possible. Thank you! I really want to use the three-ring binder, but for some reason, when I open the template that you provided in normal view, I am unable to select any of the elements to make changes. e.g. the cover to change colors, the tabs to change the names, etc. I went to the master slides and am still unable to change the color scheme. Any idea what I’m doing wrong? Thanks. Great tutorial! Easy to follow and the ideas are immediately applicable. I have a problem using the template that I downloaded though. I want to create the transition slides for each section, like in the tutorial. I work in Power Point 2003 though and the Chevron arrow is different between the versions. I can’t find a way to get the arrow…they aren’t on the graphic slides and they are already merged into the course slides. For me to create more “pages” or the “next” Chevron for the transition slides I don’t have any navigation. I just CAN’T have inconsistent arrows. Is there any way you could post the same arrow or tell me what I’m doing wrong. @brandy: the arrows are on the master slide. They’re made using the ppt shapes so you can delete the ones on the master and create your own. Thanks for the response Tom. I already tried to copy them from the master, but the only thing it copies is the hyperlink and when I try to click on the Chevron it is already a part of the entire png image, so it won’t just copy the arrow. I also went to the graphics files to ungroup them and copy the arrow but it wassn’t in the graphics files. @Brandy: there are two files. One file is used to create the graphics. The other is the course file. You can edit the graphics file. Thanks! Still new to using templates created by others…used to doing it all myself and just found this awesome template you are letting us use. I’ve never downloaded a template and tried to modify it but now it’s a lessons learned I won’t forget. Thanks for all the great ideas and downloads! @Tri-Hue: the masters in PowerPoint 2003 are a bit more challenging because the layouts are separated from the master. I have noticed that when creating boxes for the hyperlinks over the tabs that you can set the transparency to 99%, making them transparent yet the linking still works both before and after you publish to Articulate. @Jim: that works and it’s what I used to do. But sometimes I would get some subtle ghosting and see the transparent box, so I quit doing it that way. In the module you use for the tutorial the section pages and tabs look seamless. However in notebook you build in the screen-cast is no discussion how to do this. When I make the pages there is a deep line between the page and the tab and it looks a little bush league. Any ideas would be very much appreciated! @Mark: contact me via the blog contact form and I can look at what you did. Can the cover and pages of the notebook be animated to look like the pages are turning/flipping? @Faye: if you’re working in PowerPoint, not easily. There are some some online who sell add-ons to PPT and a while back I saw one that looked like a page flip. You can probably do a search for it on the ‘net. Just wanted to let you know that I liked this idea so much I took your feedback and made it my own. I was able to create a 17-Tab reference notebook on Vaccines. I couldn’t have done it without your clear instructions and just wanted to say Thanks! Thanks for the comments. Articulate is working on some cool stuff which will publish to HTML5. We’ve shared a little bit about Storyline at recent conferences and that’s been really well received. I’m excited about what we’re doing and think people will like what they’ll be able to do and still maintain the best of rapid authoring. As far as Keynote, it’s an option for some, but my post was more for those who already have PowerPoint and a lot of content created in it. The ideas aren’t an end all to mobile learning, but just a simple way to get started. Beneficial article. Continue to keep up the very amazing work. Will you perhaps be doing this in storyline? I am not referring to the graphics, but more relating to variables with the tabs and buttons. @Karen: I am going to go through some of my older PPT templates and rework them in Storyline. The notebook template would be pretty easy to do.